Kettle corn, a slightly sweet and salty snack, is found at fairs, farmer's markets as well as local grocers. Its calorie content varies significantly based on the ingredients used to prepare it. Kettle corn is often made with sugar alone, but some prepare it with salt as well. Kettle Corn Popcorn has 441 Calories and 5.88 g of Protein per 100 gram serving according to the nutrition facts provided by the USDA Food Composition Database. 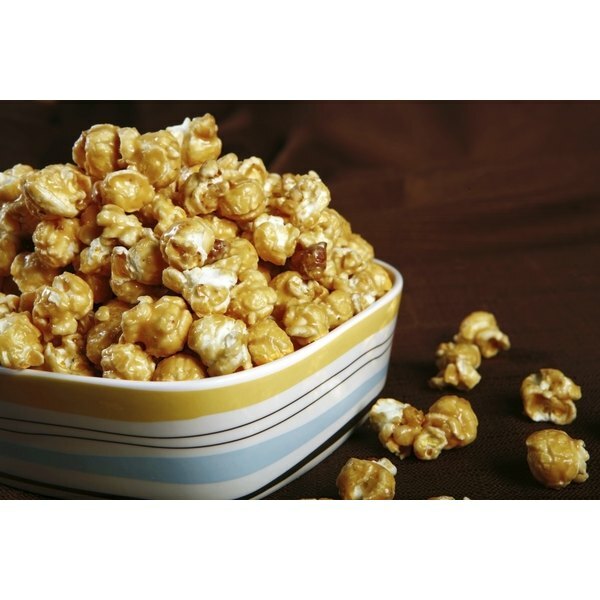 Kettle corn popcorn comes in its original flavor, a salt and sugar variety, along with other flavor combinations such as chili cheese, cinnamon sugar and white cheddar. Microwaveable versions often contain fewer calorie and fat than regular kettle corn. Kettle corn popcorn ingredients usually include peanut or corn oil, popcorn, salt, chili powder, natural cheese flavoring, cinnamon, cheddar cheese, butter, whey, cream, buttermilk, lactic acid, sugar, and other natural and artificial flavors. One serving serving of kettle corn popcorn -- about 2 cups -- contains 150 to 300 calories, depending on the maker. A serving also has up to 15 to 20 grams of carbohydrates and anywhere from 9 to 24 grams of fat. If your kettle corn contains sodium it can contain from 150 to 350 milligrams in a 2-cup serving. What Is the Nutritional Value of JELL-O? How Much Sugar Is in Popcorn?